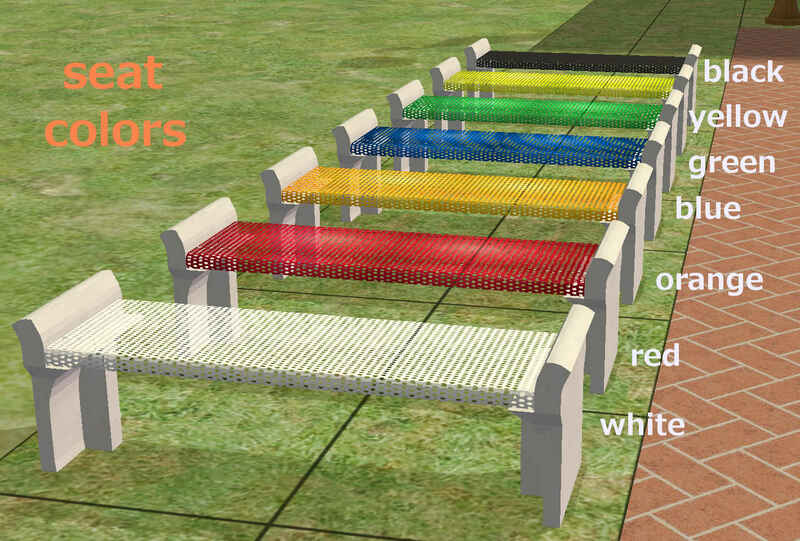 Here's a handful of benches (and extras) to give you a little more variety when decorating a new Community lot. 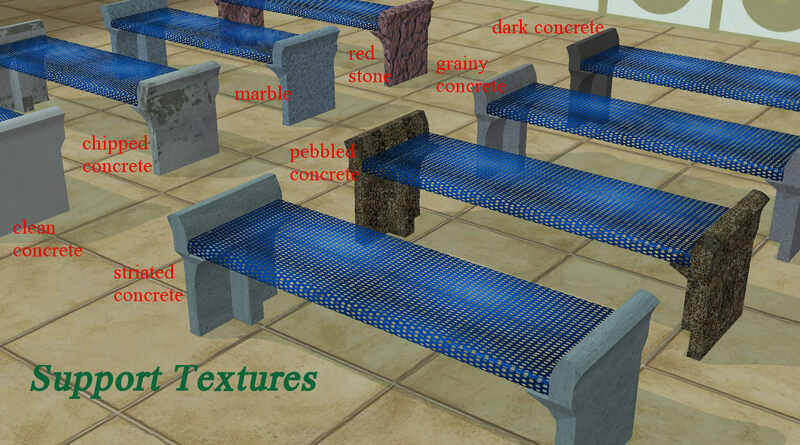 They all have two recolorable subsets - 'parkbench' and 'supports'. Don't feel limited to community lots, either - they look great in your gardens and porches, too. 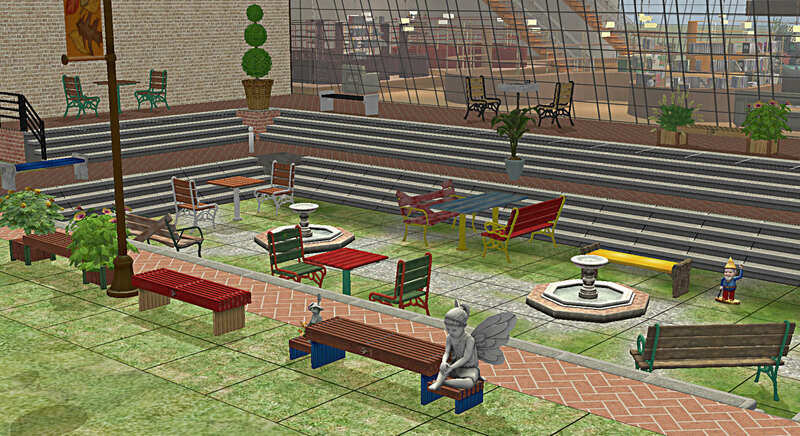 Let's start with the Broken Bench and 2-Tile Park Plates Midi Outdoor Dining Table, because they require some files that are not in this upload. These two objects are slaved to the CEP-EXTRA Piece of Quiet Park Bench. The CEP-EXTRA and the recolor package in the same post are required so the metal parts can have multiple colors. Without them, the metal parts will just flash blue in your game. Remember to read the installation instructions for the CEP-Extra - the process is a little different than for normal custom content. Although not required, I highly recommend gabilei123's CEP-EXTRAs for the Outdoor dining chair and mini table. 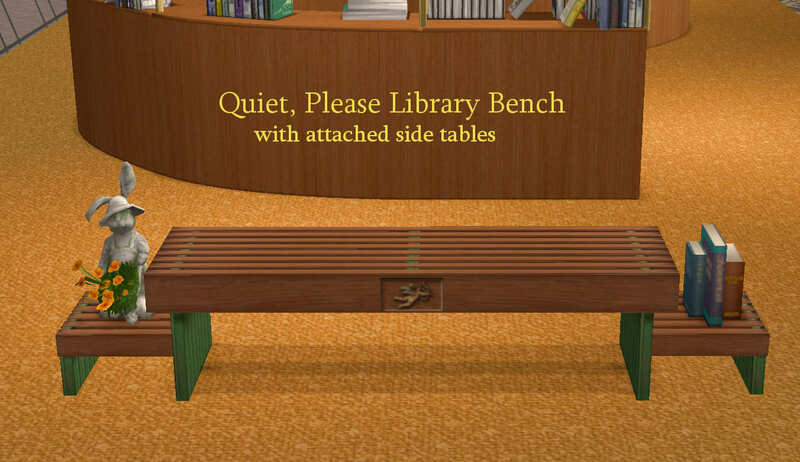 This will enable matching all five pieces of furniture (Piece of Quiet Bench, Broken Bench, Mini Table, Midi Table, and Chair). 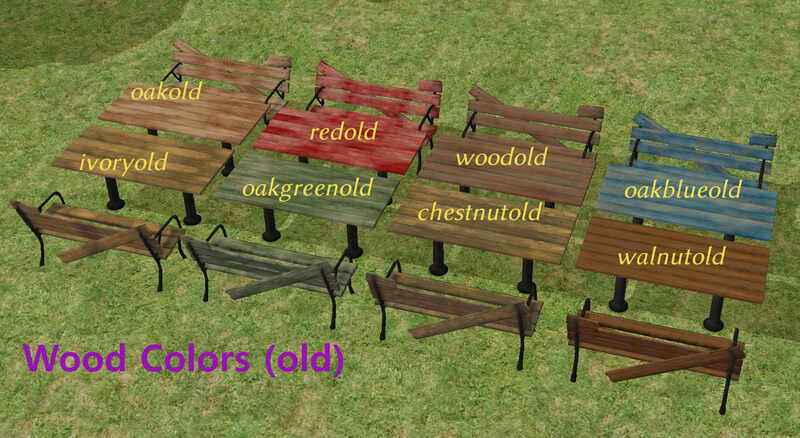 Also included in the .rar file with the broken bench and table objects is a new recolor package which adds some aged/weathered wood textures as well as the walnut and chestnut textures from the mini table to all the other pieces. 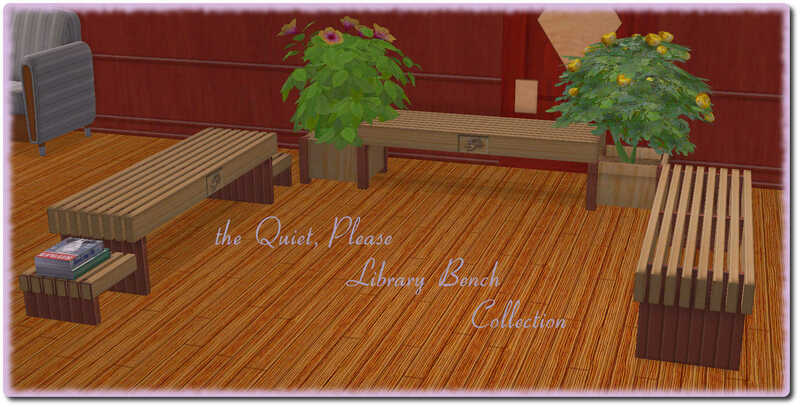 The Quiet, Please Library Set is also repositoried, but not to anything outside this post. 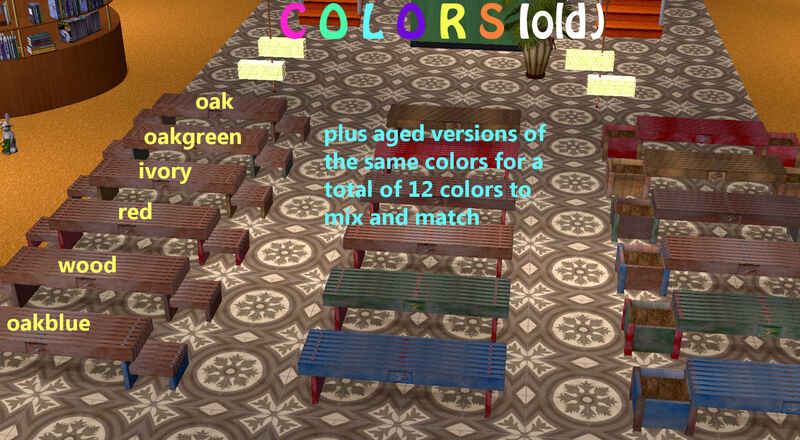 The planter and table versions are slaved to the plain version. Just drop all three in your downloads folder and they will work fine. The table and planter versions extend slightly past the game tile footprint, so take care when placing them not to let them clip through other objects. They both have extra slots for placing deco or clutter on the extended parts. 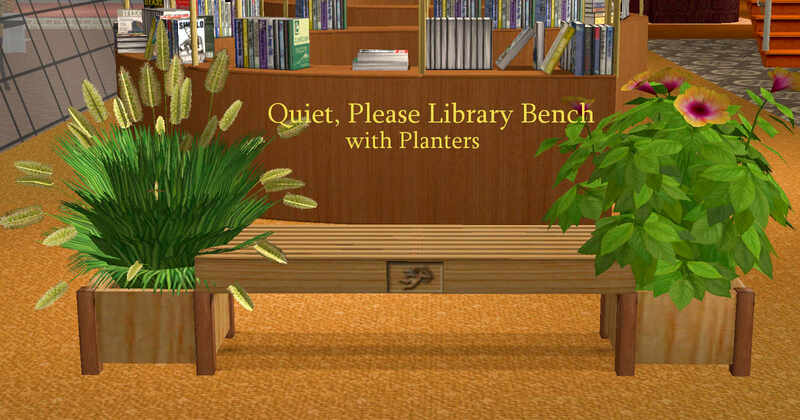 I had a hard time finding plants that fit the planters with the original table-type slots, so I changed them to ground slots, which made them work with a wider variety of CC plants. Most of the CC plants I had were too big, but had great luck with plants that specify they were made for buggybooz' small planters. Finally, the Aerated Bench. I saw this bench in a park in Texas, and fell in love with it's simple design and elegant functionality. 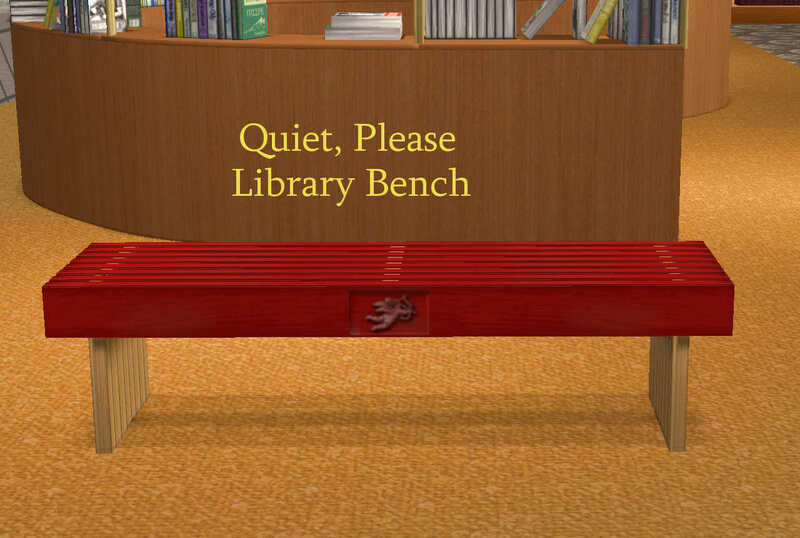 This one was hardest for me to make - not because of the mesh, but because I used non-The Sims textures and ,every time I got one texture looking good, the others looked like crap. Still not perfect, but I finally got the UV mapping manageable enough to look decent. 50 people have said thanks to d4RE for this download.